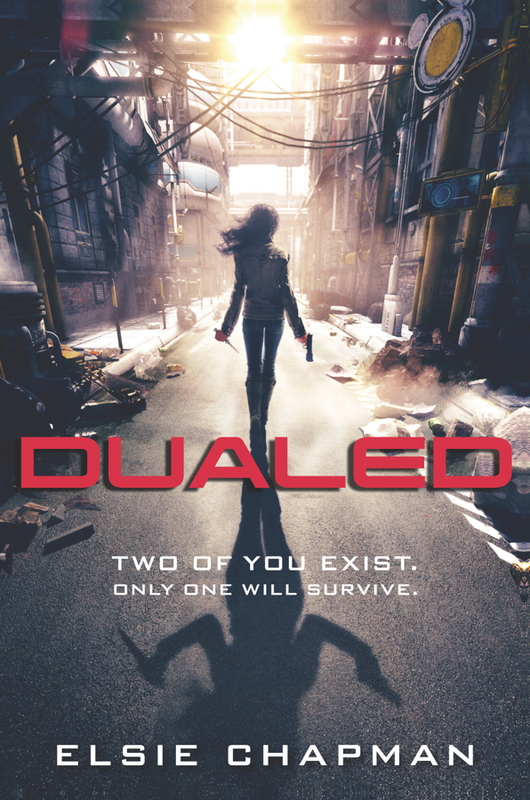 Today, we’re happy to interview Elsie Chapman, author of DUALED, which releases today! Here’s the blurb. DUALED has a fascinating premise. Everyone is born with an Alternate, and they have to kill their Alt in order to survive to adulthood. How did you come up with it? My son asked me out of the blue one day how did we know for sure we all didn’t have an other out there and just didn’t know he or she existed. The question was the spark, so to speak, and then I started thinking about what it could mean if only one of the pair could continue to exist. If you were activated today, how would you go after your Alt? And which of your weaknesses could your Alt exploit to kill you? I think I’d have to rely on being sneaky or tricky because I’m not physically coordinated enough to pull off much in terms of direct action. For my Alt, all she’d have to do is scare me by pretending to be a ghost or something. Anything supernatural scares the crap out of me. West is a great shot with a gun, and a less impressive knife thrower. Do you have any real life weapons experience? Not at all. I can barely cut vegetables without hurting myself. Even my kids can’t watch me handle a knife without cringing. And I’ve never held a gun in my life (unless water, nerf, or glue guns count). Death and killing obviously play a central role in DUALED. And it occurs in many contexts. Sometimes people die so that their Alt can live. Other people die accidentally as “peripheral kills” when Alts are battling each other. And yet others are killed by strikers, hired by their Alts to do their dirty work for them. As you were writing this, what were your thoughts about portraying killing and its ethical implications in all its different contexts? I guess writing all those death scenarios was my way of exploring human loss and all the ways we learn to cope with it. So it was more the aftermath I was interested in looking at, versus the act itself that led to it, whether it was a direct killing or an accidental death. What’s your best advice for writers in the 1) drafting stage, 2) querying stage, 3) submission stage and 4) post book deal, pre-release stage? 1) Drafting stage: Write what feels right, not what you think you should be writing. It’s smart to pay attention to the market if your end goal is to be published, but don’t it be what drives you. 2) Querying stage: It’s okay to get down about rejection, and you will be rejected. The important thing is finding a way to move past it and keep writing. It only takes one agent to love your book. 3) Submission stage: Same as above, except it can be even harder because mentally, you’re always thinking, this is it, this is the last stop. Which isn’t necessarily true since there’s lots of houses to which your agent can submit your manuscript. But it’s hard to remember that, so just work on something new while you wait. Whatever it takes to keep from going crazy. 4) Post book deal, pre-release stage: Goodreads is not your friend, and you’ll save yourself a lot of mental anguish by staying away. You also don’t need to be reading reviews, good or bad, because none of that will help with your writing (and if there is anything you do need to see, your editor will let you know). Enjoy the good stuff because there’s going to be a lot of it, and do your best to let the not-so-good stuff roll off your back. Getting published is an incredible thing, and there is a reason why you’re getting published. Don’t let anyone make you believe otherwise. Instead of picking just two or three individual books, I can tell you what authors I used to always look for in the library. I loved Christopher Pike as a kid, also VC Andrews, Lois Duncan, and Stephen King. I read anything they wrote, they were my go-tos. Livia Blackburne is a fantasy writer and recovering neuroscientist. She wrote her debut MIDNIGHT THIEF while conducting her dissertation research at MIT on the neural correlates of reading in children. She blogs about the intersection of psychology and writing on her blog A Brain Scientist’s Take on Writing. Well. This sounds freaking amazing. Great interview, Elsie and Livia! This sounds incredible!! I love this premise! And better yet, how you arrived there! I love when a benign question gets your muse moving! Like you, knives and I don’t play well together. In fact, I somehow managed to slice my finger on a gum wrapper. #blonde.